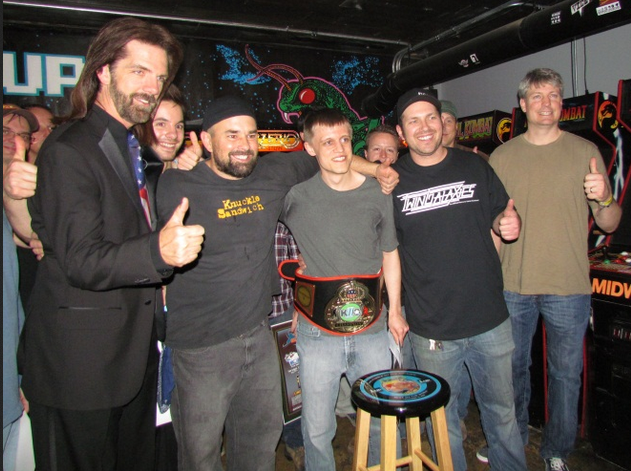 October 21st, 2013 - Defending Kong Off 2 champion Jeff Willms easily triumphed last weekend during the most recent "DK Online Open", the final installment in a three-part tournament series designed to pre-qualify 8 players for a spot in the Wildcard Division at the Kong Off 3. Willms was of course not gunning for one of the wildcard spots (as he is one of the 12 "main lineup" competitors), but rather the $250 first prize. He took it down with a fearsome drive-by shellacking that sent the message loud and clear that he will be the player to beat in November. Willms' score of 1,090,700 was not only huge in its own right (only four players have ever scored higher), and more than enough to win the tournament, but was also the highest for the series, edging out Dean Saglio's 1,087,500 from Wildcard Qualifier #1. Hank Chien, world record holder on the arcade platform, struggled through a difficult weekend but never surrendered, coming through in the late hours with a strong second-place showing. Chien, playing purely for the competition, forfeited his $100 prize. Rounding out the top 3 was rising Konger Corey Chambers, referee of the unofficial community-run DK high score list at Donkey Kong Forum, creator of the upcoming DonkeyKongGenius.com, and recent inductee into the official Twin Galaxies Donkey Kong high score list, where he now sits in 16th place all-time. At the close of the tournament, contenders for the wildcard spots were pleased to receive the surprise announcement that the number of machines set aside for the Wildcard Division had been increased from 8 to 10, allowing two more players to bypass the (sure to be crowded) Live Wildcard Qualifier on Friday November 15th at the Kong Off 3. The 10 pre-qualified wildcard spots are now set (pending confirmation by attendees). As for the dedicated-machine "all time top 12" main lineup, October 25th is the deadline to submit a top 12 score to Twin Galaxies. Excitement is high and tension is mounting. A report on the dramatic last-minute battle for the Top 12, and the list of wildcard pre-qualifiers who both earned a spot and will be attending the Kong Off 3, is coming soon. A big thanks to Eric Tessler and John Salter for organizing and generously sponsoring the Wildcard Qualifier tournaments. In my capacity from all angles as a stressed-out competitor, thrilled spectator, technical facilitator, and reporter, this series was an experience I won't ever forget. This list is not final and will be adjusted depending on who is attending the Kong Off 3, and which (if any) of these pre-qualifiers manages to "upgrade" to a Top 12 main lineup position by October 25th.